Healing Resonance Articles by Kristi Borst: Is it LOVE or FEAR? What Will You See? What Will You Own? 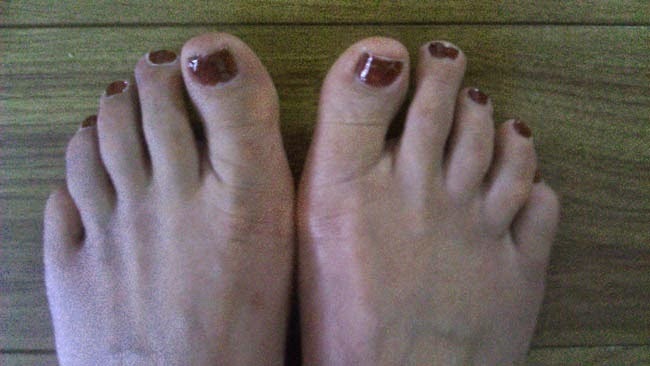 Then one day, amazingly, rather than looking at that one toe, I looked at the toes beside it. And for the first time in my life, I noticed that they were shorter than their companions on my left foot. What? The long toe wasn't long? The other toes were short! Really!?! And in that moment, I had this immense love for that one toe. How it must have been the one to help steady me since my "big toe" was short. How it probably offset the ill effects of having these two short toes. By really seeing myself in that moment, consciously, I learned something huge about myself. This one incident made me wonder what else I thought I was seeing but was really not seeing. It opened doors to exploring senses and gifts long-since shut down. I began to see realities beyond what I could have imagined, both for myself and others. When you are able to observe yourself in judgment of self and others, you have an opportunity in that moment to transform fear into love. You can choose (because our power is in realizing and seizing the choices) whether you want to own that fear. Try it on for size ... actually feel that which you are fearing. Many times in this exercise, too, you realize that the fear is just an outdated program that you no longer need. Without curiosity, the mind only see what it thinks it WILL see. Open yourSelf to seeing something new in the things you take for granted. See, hear, smell, taste, feel with not only your physical senses but also with child-like wonder. You may discover things you have overlooked for your entire life, yet which were "right under your nose." Seize your power; you CAN change the world when you change the way you see the world and yourself within it! Here is the audio from this segment of Perspective Reboot® with Kristi Borst.